Most people mistakenly believe that their IRA must be invested in bank CDs, the stock market, or mutual funds. Few Investors realize that the IRS has always permitted real estate to be held inside IRA retirement accounts. Investments in real estate with a Self-Directed IRA LLC are fully permissible under the Employee Retirement Income Security Act of 1974 (ERISA). IRS rules permit you to engage in almost any type of real estate investment, aside generally from any investment involving a disqualified person. Income or gains generated by an IRA generate tax-deferred/tax-free profits. Using a Self-Directed IRA LLC to purchase real estate allows the IRA to earn tax-free income/gains and pay taxes at a future date (in the case of a Roth IRA the income/gains are always tax-free), rather than in the year the investment produces income. With a Self-Directed IRA LLC, you can invest tax-free and not have to pay taxes right away – or in the case of a Roth IRA – ever! All the income or gains from your real estate deals flow through to your IRA tax-free! When purchasing real estate with a Self-Directed IRA LLC, in general, all income and gains generated by your pre-tax retirement account investment would generally flow back into the retirement account tax-free. Instead of paying tax on the returns of a real estate investment, tax is paid only at a later date, leaving the real estate investment to grow unhindered. Generally, self-directed IRA real estate investments are usually made when a person is earning higher income and is taxed at a higher tax rate. Withdrawals are made from an investment account when a person is earning little or no income and is taxed at a lower rate. For example, if Joe established a Self-Directed IRA LLC with $100,000 to purchase real estate and make other investments. Assume Joe kept his Self-Directed IRA LLC open for 20 years. Further assume that Joe was able to generate an average annual pre-tax rate of return of 8% and the average tax rate was 25%. By using a tax-deferred Self-Directed IRA LLC strategy, after 20 years Joe’s $100,000 investment would be worth $466,098 – a whopping $349,572 after taxes on the earnings. Whereas, if Joe made the investments with taxable funds (non-retirement funds) Joe would have only accumulated $320,714 after 20 years. 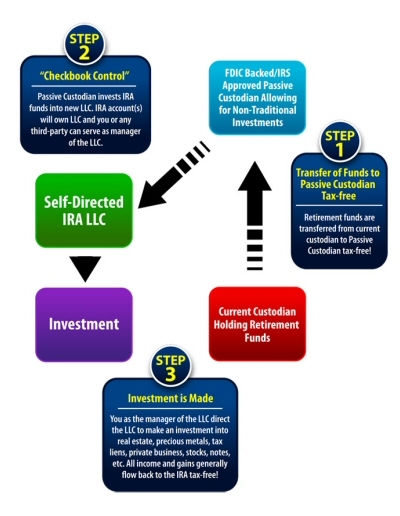 Investing in Real Estate with a Self-Directed IRA LLC is Quick & Easy! Purchasing real estate with a Self-Directed IRA LLC is essentially the same as purchasing real estate personally. All expenses paid from the investment property go through the Self-Directed IRA LLC. Likewise, all rental income checks must be deposited directly in to the Self-Directed IRA LLC bank account. No IRA related investment checks should be deposited into your personal accounts. If you don’t have sufficient funds in your Self-Directed IRA LLC to make a real estate purchase outright, your Self-Directed IRA LLC can purchase an interest in the property along with a family member (non-disqualified person – any family member other than a parent, child, spouse, daughter-in-law, son-in–law), friend, or colleague. The investment would not be made into an entity owned by the IRA owner, but instead would be invested directly into the property. For example, your Self-Directed IRA LLC could partner with a family member (non disqualified person – any family member other than a parent, child, spouse, daughter-in-law, son-in–law), friend, or colleague to purchase a piece of property for $150,000. Your Self-Directed IRA LLC could purchase an interest in the property (i.e. 50% for $75,000) and your family member, friend, or colleague could purchase the remaining interest (i.e. 50% for $75,000). Likely not if the transaction is structured correctly. Investing in an investment entity with a family member and investing in an investment property directly are two different transaction structures that impact whether the transaction will be prohibited under Code Section 4975. The different tax treatment is based on who currently owns the investment. Using a Self-Directed IRA LLC to invest in an entity that is owned by a family member who is a disqualified person will likely be treated as a prohibited transaction. However, partnering with a family member that is a non-disqualified person directly into an investment property would likely not be a prohibited transaction. Note: If you, a family member, or other disqualified person already owns a property, then investing in that property with your Self-Directed IRA LLC would be prohibited. The IRA Financial Group was founded by a group of top law firm tax and ERISA lawyers who have worked at some of the largest law firms in the United States, such as White & Case LLP, Dewey & LeBoeuf LLP, and Thelen LLP. Over the years, we have helped thousands of clients establish IRS compliant Self-Directed IRA LLC solutions. With our work experience at some of the largest law firms in the country, our retirement tax professionals’ tax and real estate IRA knowledge in this area is unmatched. To learn more about using a Self-Directed IRA LLC to invest in real estate, please contact one of our Self-Directed IRA Experts at 800-472-0646 for more information.